If the Edelman Trust Barometer wasn’t enough of a wake up call to the marketing industry that organisations need to focus on building trust, new research from PulseCheck should provide a further reason to kick start a debate about organisations’ communications priorities. Last week, the Barometer revealed that, globally, trust in charities, NGOs, business and media has declined across the board and the UK is now ranked as a net ‘distruster’ nation with just 39% of the British population trusting public, private and charitable bodies. But the findings of the Barometer suggested that a clear commitment to ethics and integrity are top of 16 specific attributes the public say will build trust in organisations. Which makes the PulseCheck research worrying reading. 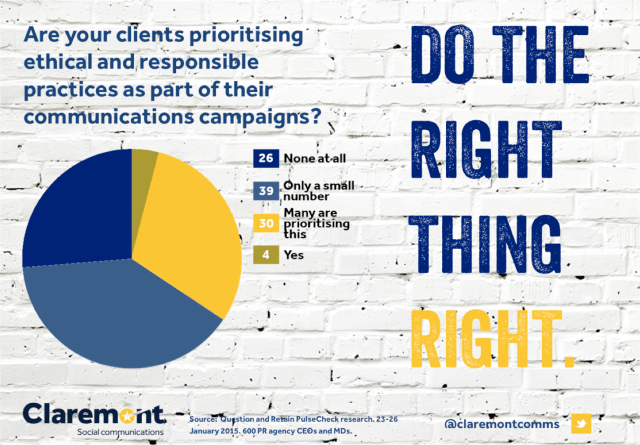 As our infographic (below) shows, just one in three PRs believe their clients will prioritise communicating their clients’ responsible practices and ethics in PR activity this year. Yet 2015 should be the year PRs focus in on building trust through communications. And, as the Drum reports, if you want to build trust, organisations must be ethical and engaging in their marketing. Putting real life stories, consumers and social interaction at the heart of marketing is just part of the solution. Organisations need to make the most of policies like apprenticeship recruitment, community engagement and corporate social responsibility in their communications to proactively demonstrate their ethical commitments and build trust. Many brands and businesses are sitting on untold treasures of good practice when it comes to behaving in an ethical and engaging way, and they should be encouraged to celebrate their achievements. We think this QandR research should act as a wake up call and marketers should look to ensure communicating ethical practices and corporate social responsibility are at the heart of PR and communications in 2015.